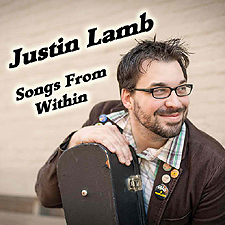 Justin Lamb is a musician from the Metro-Detroit area. He uses his passion for multiple genres of music to entertain people and dive deep within his own subconscious and try to put the thoughts he doesn't even know he's thinking on paper. And as his very own website proudly claims, "Someone has to sing this stuff. Thank God it's him." This highly-impressive album kicks-off with the fast-paced, and uber catchy ‘Figuring It Out.’ A song about never being happy until you can find out what’s truly going on within you, it is a true highlight of this new album. Great guitar work combined with a distinct vocals it’s a foot tapper, that’s for sure. The Kickstarter-funded album continues on with the heel-clickin’ ’Better Things To Say,’ a song that moves so fast you half expect it to derail before it gets anywhere near the chorus! The harder ‘Younger Everyday’ is next and brings some wicked electric, slightly distorted guitar to the fore. Another foot tapper, it speaks volumes about the older crowd learning to remember and embrace the good, fun times; no matter your age. The bounce-along telltale reveal of ‘Broken Heart’ is next and together with Lamb’s vocal styling really brings with it an Ed Robinson-esque (BNL) vibe. And that continues, although to a lesser degree on ‘When I’m Leaving,’ a medium-paced track that is yet again a musical treat. Come ‘Should Have Been Famous,’ and as it opens you might think you’re in for the first ballad of the album. But you’d be wrong as before you can finish your thought, Lamb cranks it up and even completes it with a Dustin Kring guitar solo. A true storytelling from the heart, perhaps, it is backed by the gentle ‘Say Hello,’ a ballad that showcases Lamb’s more sedate vocals coupled with some lovely, gentle acoustic guitar. Together with the aforementioned Kring on lead guitar, Lamb uses both Billy Perkins on bass guitar and Robert Shannon on drums and percussion. They all come together on ‘Running,’ another track that just sounds so personal, lyrically from the heart. The soul-driven jaunt ‘My Hell’ is next and is backed by the delicate-at-first ‘Goodbye,’ a perfect way to end any album of this quality. Well, save for the age-old “hidden track” live one take ‘Hungover You,’ a group sing-along Country-style!